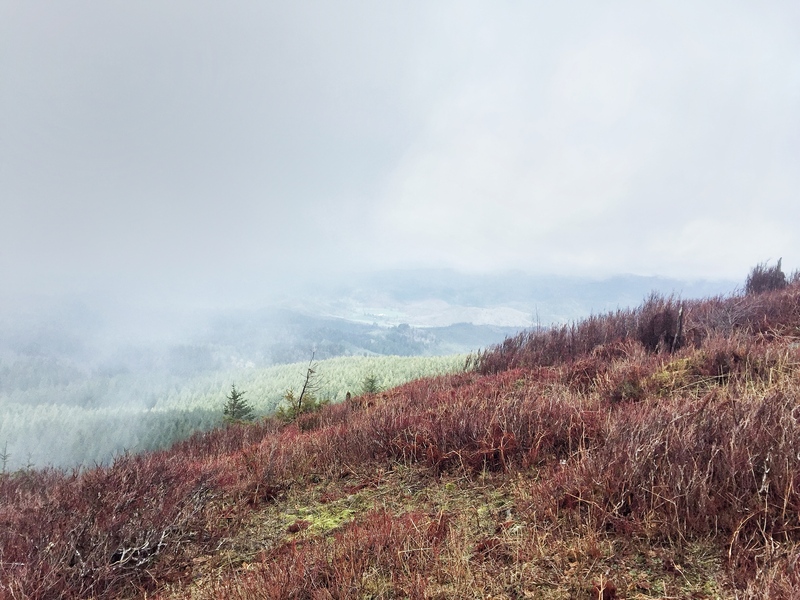 The clouds were rolling in at the summit, which sits at 3,153 feet — a climb of about 1,400 feet from the Hebo Lake Campground. 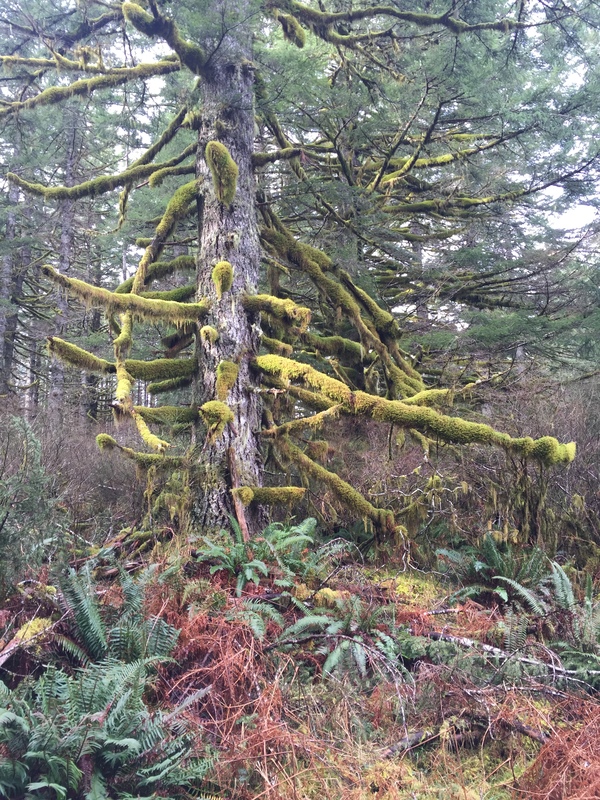 A beautiful tree, shrubs and moss. The trail got sloppy in some places near the top, including this area where water was running down the trail. Starting at the campground, the first 4+ miles are all uphill. There were some wet, sloppy areas along the Pioneer-Indian Trail on my late February run, but this is definitely a trail worth visiting. 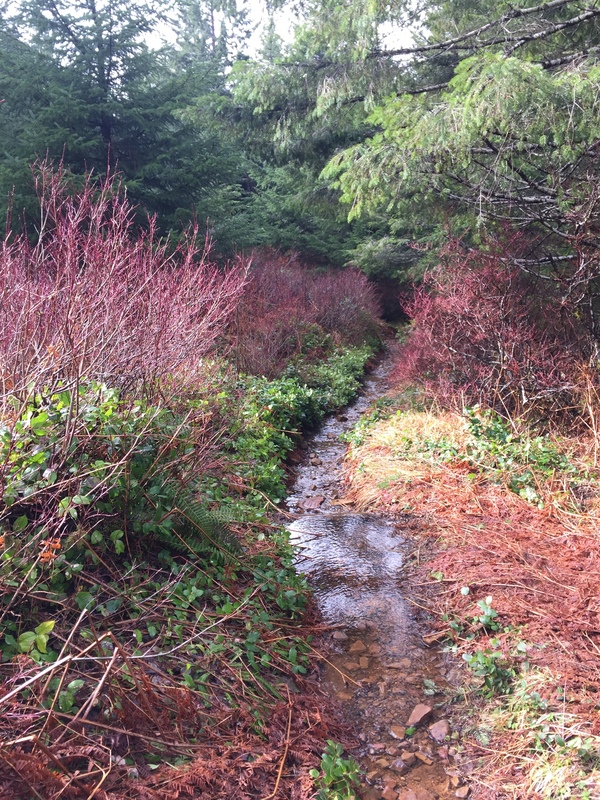 Hebo, Oregon, is just 30 minutes or so north of Lincoln City, and the trail takes off from the Hebo Lake Campground, just a few miles further up Forest Road 14. The Pioneer-Indian Trail runs 8 miles from the campground to South Lake, which offers dispersed camping. I ran just 5 miles of the trail, making for a 10-mile out-and-back workout. I’ll have to run the entire length of the trail another day. The trail never strays too far from Forest Road 14, and many folks leave vehicles at both ends to avoid the out-and-back hike. 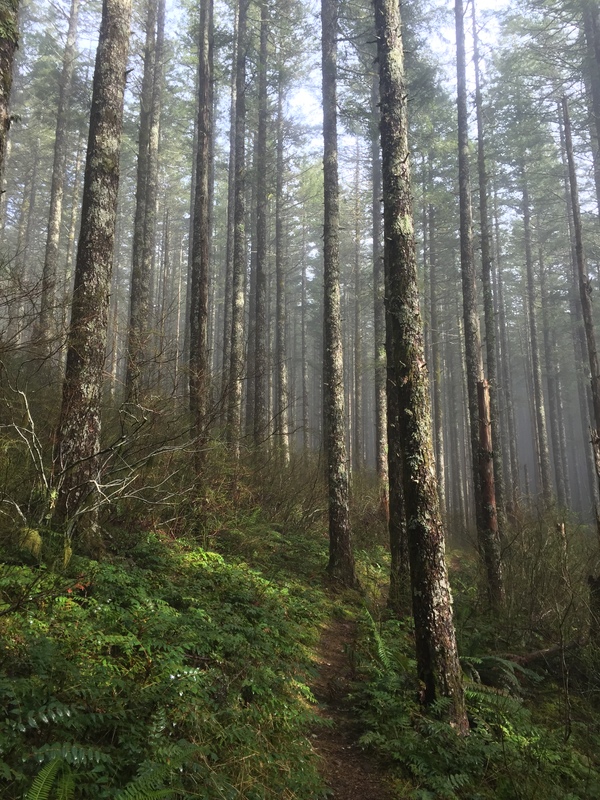 From the Hebo Lake Campground, the trail climbs steadily for 4+ miles, winding through Douglas fir that were planted in 1912 after a massive fire. The trail is mostly single track, covered alternately in rocks, roots and forest trash. Hikers do share part of the trail with equestrians. I saw just a couple patches of snow, but they say that the roads can become impassable due to snow in the winter. Traffic signs say the road is not maintained in the winter. Officially, the high point is 3,153 feet, although my GPS registered 3,159. The campground was situated at about 1,750 feet, which means the trail averaged a 6.5% grade. The top of the mountain features a long, open meadow; the temperature dropped noticeably, and there was nothing to stop the wind. The trail itself gets its name because it was originally the route for Indians and then settlers to cross the Coastal Range from the Willamette Valley. On a clear day, you can see the Cascade Mountain Range to the east, the Pacific Ocean to the west or Tillamook Bay to the north. But there were enough low-hanging clouds during my visit that the view was limited. Getting there: To reach the trailhead at Hebo Lake Campground, head 24 miles north of Lincoln City to Hebo. Turn east on Highway 22 and go just .2 miles to the Hebo Ranger Station. Turn right before the Ranger Station, and take the winding Forest Road 14 a little more than 4 miles to the campground. On the day I visited, the campground was closed, so I parked along the road, and ran to the trailhead, which was only about a quarter mile. Love the shots of Oregon. Seems like you’re adapting well to the great Northwest. Gotta get out there, perhaps in September after I summit Mount Rainier. It’s pretty much a straight shot down to here from Rainier, Jim. Come down, and we’ll run some trails. Or maybe hike them, if you’re still recovering.